The e-book is now online and available. More information here including links to e-reader software for your Windows or Mac OS X computer. The e-book includes access to video tutorials that supplement the text. A big thank you to all of you that have found this web site and its tutorials helpful to you and your projects! UPDATE: Sales of the print version of Volume 4 are being discontinued as of October 18, 2016, due to rampant copyright theft. There are more used copies for sale than the total number of printed books actually sold. Based on sales, readers prefer the e-book version – therefore I am in process of discontinuing sales of the print version. The e-book continues to be available. 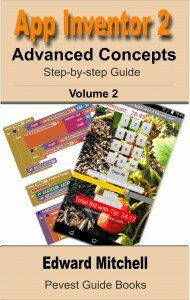 Volume 4 of my App Inventor guide books series is now available in e-book and print format. The book also includes video-based tutorials to supplement the text. 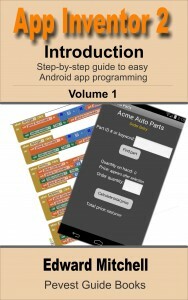 MIT App Inventor is the fast and simple way to develop Android apps. Using a programming system that runs in your Internet browser, just drag and drop user interface components and link together program functions on screen, and then run your app directly on your Android phone or tablet. Learn to create apps using simplified interactive image sprites and to control movement using a finger on the screen or by tilting the phone or tablet. Learn how to use the “Canvas” features for drawing, including a unique way to implement traditional animation features. Includes numerous sample apps, detailed explanations, illustrations, app source code downloads and links to video tutorials. Volume 4 introduces the use of graphics drawing features, including general graphics features, image sprites, animation and charting. Charting refers to the creation of line, column, scatter plot, and strip recorder charts commonly used in business and finance. This is volume 4 of a 4 volume set. 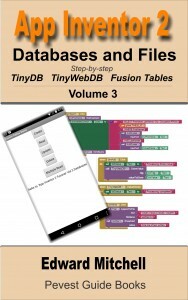 Volume 1 introduces App Inventor programming, Volume 2 introduces advanced features and Volume 3 covers databases and files. 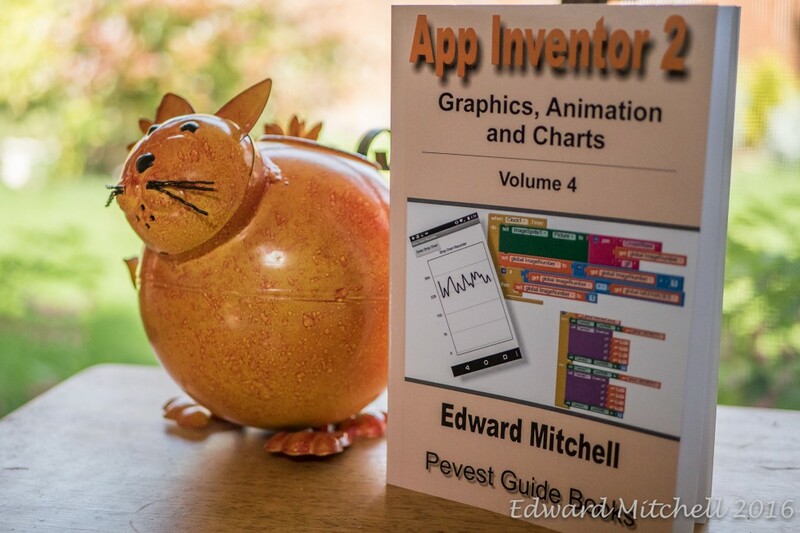 Visit the web site at appinventor.pevest.com to learn more about App Inventor and find more tutorials, resources, links to App Inventor books and other App Inventor web sites. Edward Mitchell is an experienced software developer, having worked in Silicon Valley, for Microsoft and other high tech firms. He has taught college and university courses in programming and information systems. He is the author or co-author of a dozen books on software development. He has a B.S. in information and computer science, an M.S. in software engineering, and an M.B.A. degree. 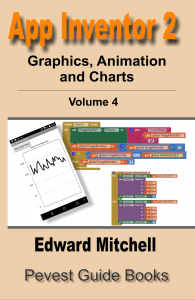 The text is an introduction to the graphics features of MIT App Inventor covering basic graphics and basic animation methods provided by MIT App Inventor, plus creating traditional animation effects using programming methods, and business/science oriented charting. This is not a text about writing games but a book about the graphics features and how to put them to use for practical applications programs.